mother Zoe. John Catsimatidis' mother Kalliope is seen on the right. NEW YORK - "Joanna, Anastasios (Ernest), Katerina, Peter (Panagiotis), Anthony, Konstantinos (Gus), Peter, Vasilios, John, Danielle, George, Peter, James, George, Theodore, Daphne, Anthony, Andrew, Michael, William, Prokopios (Paul)." Archbishop Demetrios read the names of each Greek victim in the September 11, 2001 attacks, at the annual memorial service marking the tragic event. Though the sounds of bulldozers and drills were silenced for a day, helicopters circling overhead at times at times buried his words. The service took place within the fenced-off construction site of Ground Zero, not this year at the lot where the destroyed St. Nicholas Church once stood, but under the concrete and steel canopy of under-construction Tower Four. About 70 people attended the somber service on the sunlit September 11, 2010 day. They included families of the victims, members of the St. Nicholas Church, Consul General of Greece Aghi Balta, Consul General of Cyprus Koula Sophianou, Congressional candidate George Demos and businessman Michael Jaharis. Archbishop Demetrios of America, who led the service, reassured families that their loved ones were now "in a place of light" and prayed for their "eternal rest." He added: "They are at peace." The service paid tribute to not only the Greek American victims, but also the nearly 3,000 people who perished that day in New York. In his words, the archbishop emphasized democratic principles and said of those who died there: "We are really deeply respectful of this great sacrifice." He read from an Old Testament passage that said that of the righteous dead that God "tested them like gold in the furnace" and "found them worthy," adding: "They will shine." Referring to the St. Nicholas church - whose rebuilding negotiations have been stalled for a year - the archbishop told the group (in both his Greek and English speeches): "We are here … also to honor another victim of the terrorist attacks - our Church of St. Nicholas." He called for it to rebuilt on the "sacred site" and for "peace and reconciliation." Though there has been much discussion in recent weeks over a failed deal with the Port Authority of New York and New Jersey over the church's rebuilding on a bigger, better site, St. Nicholas representatives sounded optimistic. At the end of the ceremony, St. Nicholas parish priest John Romas vowed: "St. Nicholas will be rebuilt here." New Parish Board President John Couloucoundis said: "We walk on hallowed ground. Blood has been spilt everywhere on this site. It's important for us to be respectful. St. Nicholas is a tragedy, but it is bricks and mortar. Bricks and mortar can be rebuilt." He went on, seeming to address not just Greek Orthodox Americans, but the entire planet: "And the doors will always be open as a sanctuary to you, as a sanctuary, regardless of faith, religion and creed." 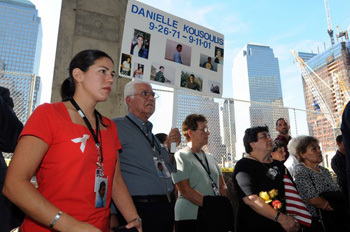 The event marked another difficult day for victims' families. "You'd think every year that it would get easier and it really doesn't," said Eleni Kousoulis, the older sister of victim Danielle Kousoulis. She wore a symbolic red, attending the memorial with her parents George and Zoe. They held up the same poster they've brought each year to the memorial service - with photographs of the attractive, young woman in various settings, the dates of her birthday (September 26, 1971) and death, and the messages "We miss you!" and "We love you!" Kousoulis noted: "It's very hard to believe that nine years has gone by, but I can't believe that I haven't seen or spoken to my sister in nine years, it makes it kind of hard to believe." Her face lit up when she started to describe her little sister: "Danielle, she was a great person. She was very generous. She had a great smile and she was fun to be around, and I want people to not only know her name, but to remember her." The mourning sibling added, "I'm looking forward to when the memorial is finished." She explained: "My family and I feel that this is Danielle's final resting place because we never got any remains back. So it's important to us to come here and feel close to Danielle." Ted Klingos, who had worked for the company Fiduciary Trust in Tower Two of the World Trade Center, was there to mourn 92 of his colleagues who died in the attacks. "Nine years will have gone by and it'll be another nine years and another nine years - and the memory of that day will never perish," he said, holding a leaflet with the names of all those who perished from his former workplace. His name was not among them, he explained, because the morning of September 11, 2001, he dropped off his daughter at school, voted in the primaries and was delayed "five or ten minutes." He entered the building, but left in time to escape with his life. He said of the furious construction at Ground Zero: "Resurrection is something that we see in the building. But the lives that were lost that day will never be replaced by any structure that is put there." Michael Voudouris, who was decorated for his work as an emergency medical technician, noted that he's come to the memorial every year. He said: "This is really an emotional moment because it shows the best we can do as a people in responding to the aid of our neighbors." He said that he had started the day attending early memorials for fallen friends. At the event, Couloucoundis told TNH "It's very tough being here." The new parish president noted that seeing the victim's families in pain only reinforced that a rebuilt St. Nicholas "has to be a place where people can come and feel comforted." He added, "Cause it's very discomforting being here." St. Nicholas board member Olga Pavlakos said the service "brought back memories of the past and also (of) 9/11 and the families and the sadness." At the same time the gathering filled her with "hope for the future, that we will rebuild St. Nicholas Church." Father John Romas said: "Today was a sad day for everybody," but voiced hope that the church may start rebuilding within the year. Parish board member Peter Zaharatos, an architect/artist, who had helped his father as a teenager reconstruct the weathered church (including major work on marble interiors) in 1988, said St. Nicholas was always "The Little Church That could." It had been his refuge when he worked on Wall Street. It was the spot where his cousin was married. Even though it no longer stood, he said, it's presence remained. "It's always here when you are on this site," he explained. James Maniatis, President Emeritus of the St. Nicholas community, who had been president between 1968 and 2001, vowed, at age 90: "As long as I have energy I'll be involved with the church." He recalled telling Romas, "I hope we are going to be around to see the new St. Nicholas church." Congressional candidate George Demos attended, just three days before the Republican primary in his heated campaign against Chris Cox in New York's Nassau County, Long Island. An outspoken critic of the proposed Islamic Cultural Center proposed to be built nearby, Demos noted: "If we can't rebuild St. Nicholas Church, the only house of worship destroyed on 9/11, then we haven't done justice to the victims who lost their lives on that tragic day." Outside the fence, on a day marked in the city by memorial tributes, curiosity-seekers stopped to stare at the service, listening to the Greek hymn "Eternal Be Their Memory." Bagpipes and cheers blared from a block away, where Scottish mourners were holding their own tributes to lost firemen and others. A security guard came to check on the Greek Orthodox service and said into her sputtering walkie talkie: "It's affirmative. They are having a ceremony." Affirmative too is the enduring importance of the annual ritual to the Greek American community.